 Equal certainly to Eckermann's table talk with Goethe and Boswell's journals about Dr. Johnson, Chukovskaya's indispensable log of her friendship with the great Russian poet Anna Akhmatova-- an act of literary and personal fidelity accomplished under the most insanely difficult circumstances--is finally available here in translation, and few books are quite as illuminating both of horror and genius. Akhmatova and her friend had relatives (her first and second husbands, as well as a son in A. 's case; a husband in Chukovskaya's) lost and gone forever into the gulag at this time; however, by force of the poet's almost eerie regalness, the state literary culture was busily publishing her selected poetry. The surreal dissonance forms the fabric of Akhmatova's days. And while Chukovskaya's journals could only hint at--and never name outright- -the reason for both women's suffering, still, like a ghost, it plays behind every word. It underlies Akhmatova's agoraphobia and heart troubles, her personal disorderliness and neediness--as well as the indelible nature of the poetry. (The poems selected as illustration here may be the best English versions we have of this great poetry period; an extra boon.) 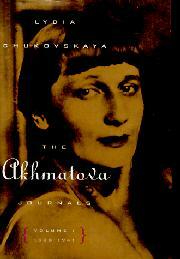 But finally Akhmatova's brilliant and succinct words and talk are (as are all great poets') beside circumstance. ``Poverty has never hampered anybody. Neither has grief. Rembrandt painted all his best works in the last two years of his life, after having lost everybody around him: his wife, son, mother....No, grief doesn't interfere with work.'' Chukovskaya, as Akhmatova's copiest, even records when punctuation was changed in the great poems--and to read over her shoulder, as it were, about the poet's reactions is to take a short course in Russian verse history as well. Ultimately these journals cohere as great works of portraiture: a picture of one of the century's most toweringly moral artists, suffering at full tide, without a jot of self-pity.